Quick snap straps for quick and easy fit. Made of a double layer of the highest quality material for extra protection. Velcro strips help quickly access polishing pads. 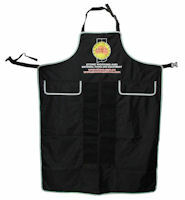 Aprons are available with customized labeling with your company's logo.